It may be small but the Sunderlage smokehouse is a mighty reflection of the rural history of Hoffman Estates. Situated on the grounds of the Sunderlage farmhouse at Vista Lane and Volid Drive, the smokehouse actually predates the house itself. The house was built in 1856 by Hiram Thurston for Johann and Catherine (Greve) Sunderlage, two of the first German landowners of Schaumburg Township. The smokehouse, according to Wilbert Hasbrouck, architect and engineer of Hasbrouck Peterson Associates, was believed to have been built sometime in the 1840s. 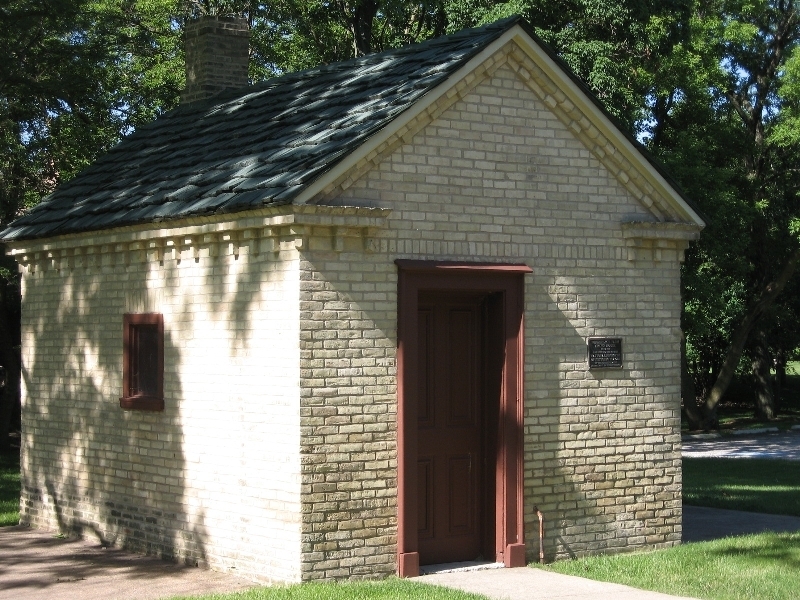 Constructed of “Cream City” brick from the Milwaukee, WI area, the smokehouse is indicative of the Greek Revival style. It is 12 feet wide by 16 feet long and is unusual in that it has two windows and is the only one of its kind in northern Illinois. The farm passed through a number of hands before finally being purchased by the village of Hoffman Estates in 1978. Restoration work was completed on the house and smokehouse by 1991 but not before the smokehouse was officially listed on the National Register of Historic Places on February 20, 1990. The Sunderlage farm is now overseen by the Hoffman Estates Historical Sites Commission. For more photos and information on the Sunderlage farm, please see the Local History Digital Archive . Browse through the Photos, then Places, Farms and, finally, Sunderlage Farm. Read the Full Records to find out more about the farm, its owners and its history. Or, read up on some of the Historical Sites Commission’s documents in the Documents portion of the Digital Archive. Some of you may be wondering, why didn’t the farmhouse itself get this distinction? Because it is not the original structure and has been added on to over the years, the farmhouse is, unfortunately, not eligible for National Register status. Sometimes prizes, though, come in small packages! This entry was posted on February 21, 2010 at 7:00 am and is filed under Farms. You can follow any responses to this entry through the RSS 2.0 feed. You can leave a response, or trackback from your own site.